Looking for a FODMAP friendly chicken recipe for the holiday season? 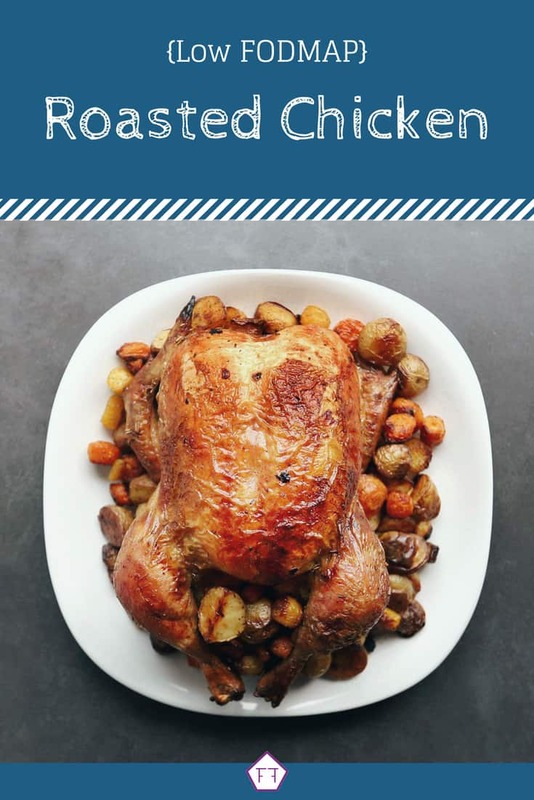 This low FODMAP roasted chicken is nice and crispy on the outside and deliciously moist on the inside. Made with a homemade brine and a delicious herb rub, you’re going to crave this chicken all year long. I like this recipe because it’s simple enough for a quiet night in with the family, but can easily be scaled up to suit a holiday-sized meal. The flavour is consistent whether you prefer chicken or turkey. So, choose whichever bird suits your event best. Think this low FODMAP roasted chicken sounds great, but you don’t have time to try it now? Don’t worry. You can PIN THIS POST for later. 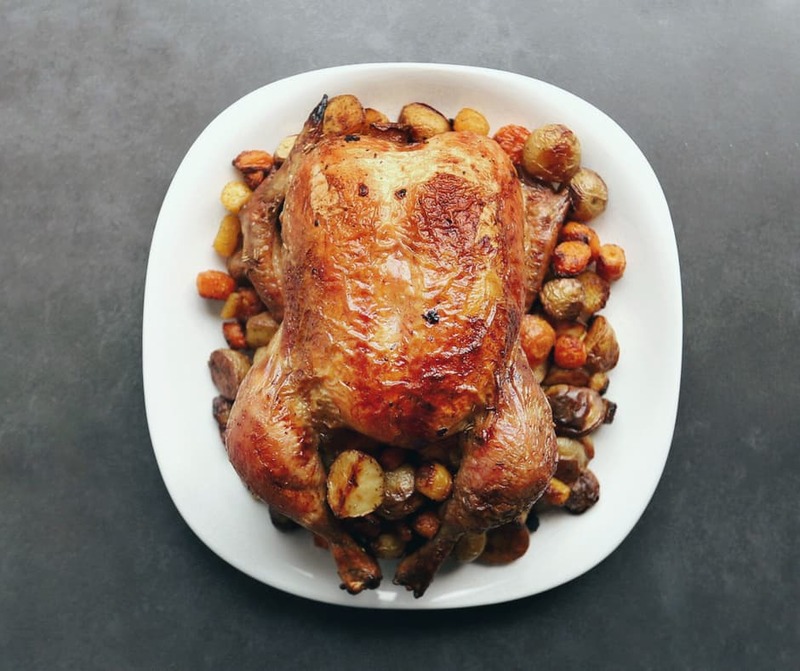 This low FODMAP roasted chicken will add some FODMAP friendly flavour to your holiday season. Check out the notes below for tips on keeping this recipe FODMAP friendly. First up is chicken. 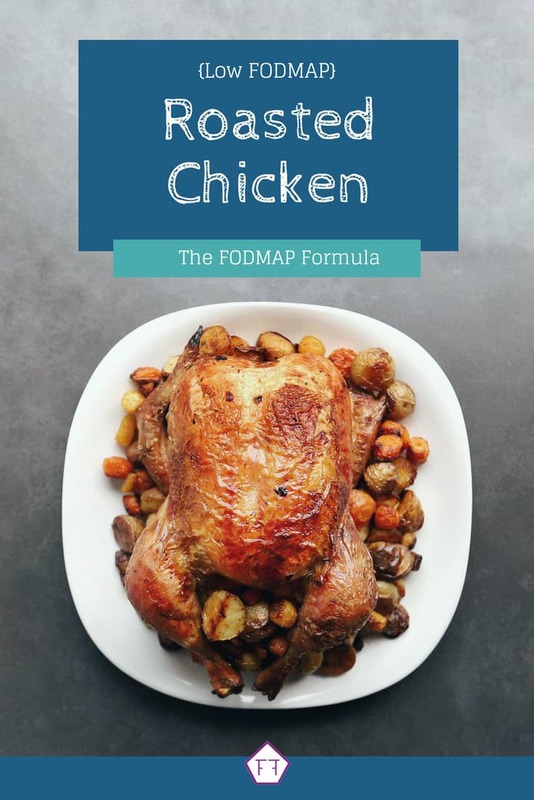 Since chicken (and turkey) are proteins, they don’t have any FODMAPs. 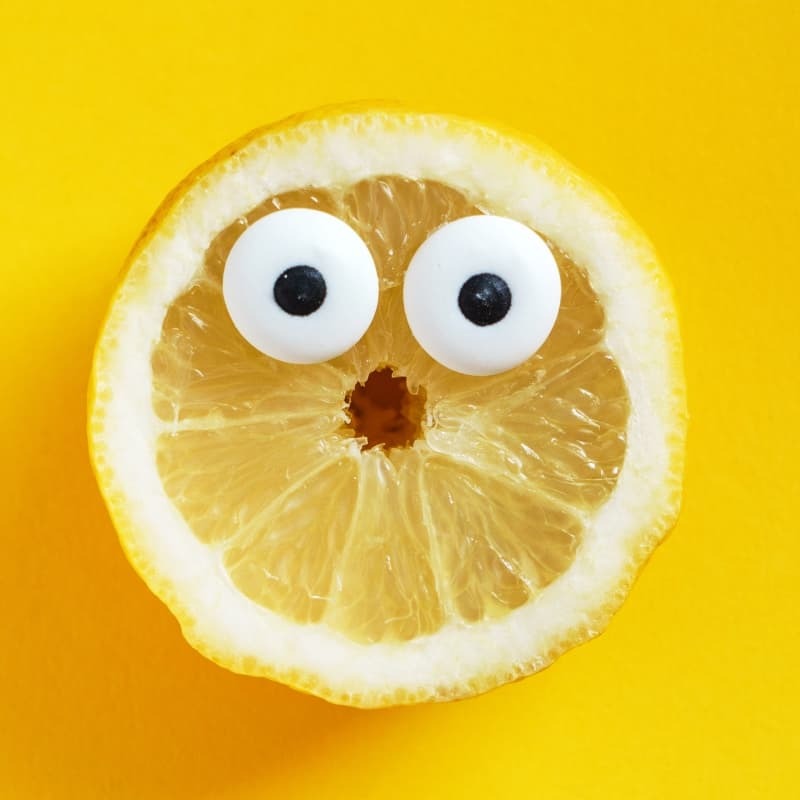 This means you can eat as much as you want without contributing to your FODMAP load. Don’t go crazy, though. Some patients are sensitive to food volume as well. Having too much food in your gut at one time can put a ton of pressure on your digestive system. This can cause symptoms, too. So keep an eye on your portion size. Next, you’re going to need 1 quart (4 cups) of vegetable stock. You can either use a pre-packaged low FODMAP vegetable stock or make your own. 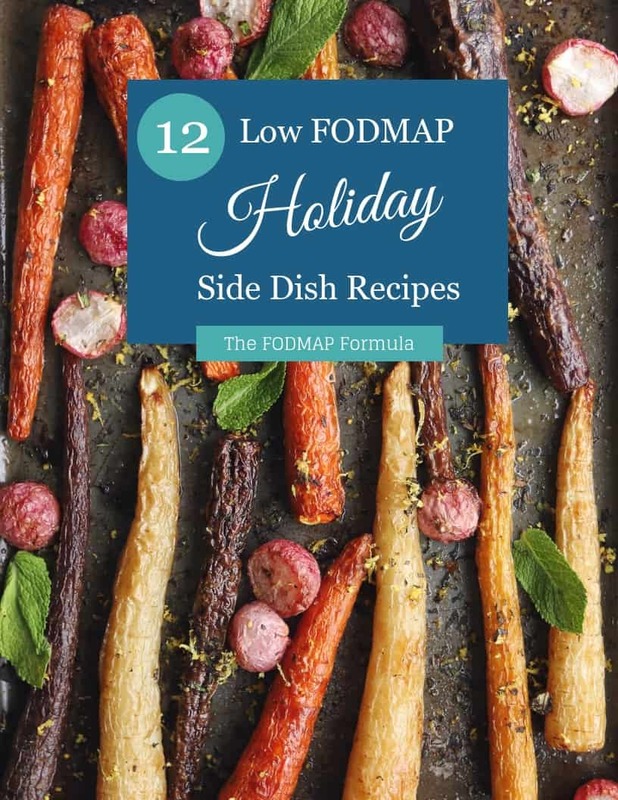 If you can’t find a low FODMAP vegetable stock at your local store, you can grab one online from Fody Foods Co. If you want to make your own, don’t panic! It’s actually pretty easy. Throw 1/2 a cup of diced green onions (green parts only), 3-4 large carrots, a hand full of fresh parsley, and a few sprigs of thyme in a stock pot with 1 tbsp of peppercorns. Cover your veggies with 6 cups of water and let it simmer for an hour. Then strain out any muck for a nice clean broth. I normally use cheesecloth for this part. This recipe makes about 4-5 cups. If you don’t end up with enough broth to cover your chicken, you can use extra water to make up the difference. If you’re using a large bird like a turkey, double the recipe. According to Monash University, there aren’t any FODMAPs in the tops of a green onion or in carrots. This means you can safely add as many as you want to your broth, brine, or stuffing without contributing to your FODMAP load. Last but not least, this recipe also uses butter. The Monash app has a note that says butter doesn’t have any FODMAPs (because it’s all fat). So, you don’t need to worry about using a lactose-free brand. I love making this roasted chicken recipe. While it’s a bit of a time commitment, it doesn’t take a whole lot of effort. Plus, it makes my house smell amazing. I normally like to pair this recipe with my low FODMAP green beans and my FODMAP friendly roasted garlic mashed potatoes. I like these side dishes for two reasons: 1) they’re delicious, and 2) I don’t need my oven (which is obviously full of chicken). If you pair your roasted chicken with something else, let me know in the comments. I’m always on the hunt for fun side dishes. 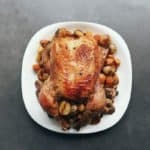 Want to try this low FODMAP roasted chicken? Don’t forget to PIN THIS POST for later. Whether you're planning a delicious family meal or a holiday feast, this low FODMAP roasted chicken is dressed to impress! The secret is a savoury brine and a delicious herb rub that leave your bird crispy on the outside and juicy on the inside. Combine brine ingredients together in a large stockpot. Bring to a boil and simmer for 5 minutes. Allow the brine to cool to room temperature and then put it in the fridge overnight. Place your bird in the brine and allow it to sit in the fridge for 6-8 hours. Preheat the oven to 450 degrees. Remove the bird from the brine and pat it dry with a paper towel. Insert carrots, green onions, fresh rosemary, and fresh thyme into the belly of the bird and secure the back legs over the opening using butchers twine. Combine butter, dried rosemary and dried thyme in a small bowl. Rub the skin of the bird with 3 tbsp of the butter mixture. Make sure to get into the crevasses under the legs and wings. Place the bird breast up on a roasting rack on a rimmed baking sheet. Cover the top of the chicken with cheesecloth and drizzle with remaining butter to keep it moist while roasting. Place the bird on the center rack and reduce heat to 350 degrees. Cook for about 20 minutes per pound, basting every 30 minutes or so using the drippings in the pan. Once the bird has reached a temperature of 170 degrees and the juices run clear, transfer the bird to a plate and allow it to stand for 15 minutes. The bird will continue to cook during this time. Once it reaches 180 degrees discard the vegetables in the abdominal cavity, carve your bird, and serve! The brine in this recipe is meant for a chicken/turkey around 4-6lbs. If you have a larger bird, make enough brine to cover your bird completely. How long your bird needs to be brined also depends on its size. If you have a large bird, brine it overnight. Make sure your brine has cooled completely before you submerge your chicken, as warm broth may breed bacteria. If you're cooking a large bird, swap out the baking sheet for a deep roasting pan. If your bird is 6 lbs or less, cook it for 20-25 minutes per pound. If your bird is 7-15 lbs, cook for 15-20 minutes per pound. If your bird is over 16 lbs, cook for 13-15 minutes per pound. Your bird is ready to come out of the oven when it reaches 170 degrees. Once it has finished resting, it should climb to 180 degrees. This low FODMAP roasted chicken will be a family tradition in no time. If you like this recipe, sign up for my mailing list below. You’ll get new recipes and articles delivered right to your inbox. Want more holiday inspiration? Follow me on Pinterest for even more FODMAP friendly ideas. Together we’ll get the Low FODMAP Diet down to a science!